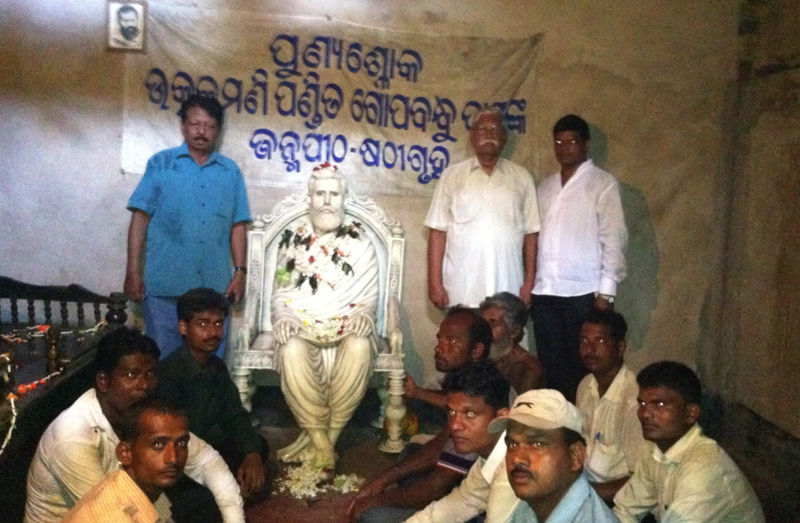 As per its program, Save the Samaja Forum (SSF) apprised the people of the fraud played upon Utkalmani Gopabandhu Das by Servants of the People Society (SoPS) in a vehicle rally that covered the area from Cuttack, the headquarters of Gopabandhu’s Samaja to his birth room at Village Suando in the district of Puri. Fans of Gopabandhu from different districts participated in the rally along with the top brass of Utkalmani Newspaper Employees Association. The rally started from Gadagadia Ghat after Tila Tarpana (oblations offered to the manes with handful of water sprinkled with seeds of sesamum indicum) offered to Gopabandhu in protest against demolition of his statue in the Gopabandhu Bhawan by the tainted members of SoPS, who have illegally captured the Samaja using a forged WILL of its founder. Motorcyclists from different districts were furbished with an accompanying auto-van displaying placards and pledges of SSF and blowing audio CDs addressed to the public on the fraud being played upon Gopabandhu since the day of his death by SoPS. The special vehicle is christened “Sankalpa Ratha” (Vehicle of Pledge). Sri Devi Prasanna Nayak, President of Utkalmani Newspaper Employees Association (UNEA) launched it to the cause of the campaign of SSF against fraud of SoPS in possessing and looting the Samaja. As the “Sankalpa Rally” (Rally of resolve to save the Samaja from swindlers) at the next destination, the Joint conveners of SSF – Prasanta Patnaik and Subhas Chandra Pattanayak – gave floral tributes to Pt. Gopabandhu in the park named after him in front of the Samaja office and condemned the SoPS hoodlums for demolition of his revered statue in the Gopabandhu Bhawan. The rally proceeded through the Cuttack city to Bhubaneswar halting in prominent nerve centers of the city to apprise people of the felonies committed by tainted members of SoPS against Samaja and Gopabandhu. President of UNEA Sri Devi Prasanna Nayak and his team took the lead. At Bhubaneswar, floral tributes were paid by the rally participants at Gopabandhu square. Prasanta Patnaik, Subhas Chandra Pattanayak and Devi Prasanna Nayak briefed the press on the spot about the Sankalpa Rally. The rally reached Suando, the birth village of Gopabandhu in the afternoon. Heirs of Gopabandhu escorted the rally members to the room in which the immortal leader of the highest humanitarian virtues had taken birth. Gopabandhu’s grandson by blood, Pt. Rabindra Das was sad to note that the Samaja dedicated to people of Orissa by Gopabandhu has become a hub of exploitation of employees and misappropriation of funds. That, its management is in the center of controversies is itself an insult to the sacred memories of Gopabandhu. Whosoever manages the Samaja must see to it that humanitarian values are not ignored in run after profit. When the family members of Gopabandhu were never given the original signed WILL of Gopabandhu, the document purported to be a copy thereof also does not have any room for non-humanitarian acts such as exploitation of employees, jettisoning of honesty for payola in business transaction and harassment of workers through non-payment of regular remuneration and coercive actions. The people of the locality, on interaction, complained about how SoPS has looted the usufruct of the properties of Gopabandhu and forgotten to make any contribution to development of his birthplace and the school he had founded. 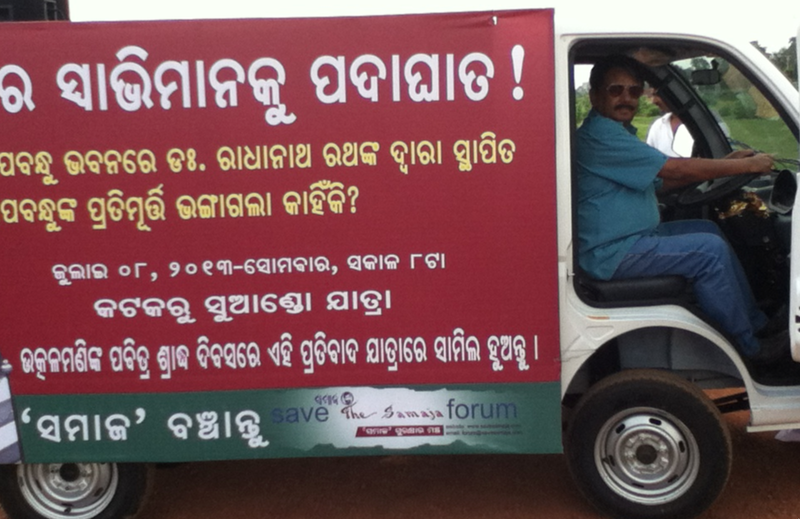 People were very happy to see that Save the Samaja Forum and employees of the Samaja organization have together launched the campaign to save the Samaja from the unholy combine of looters under the banner of SoPS. Eminent media consultant and SSF coordinator Pabitra Maharatha managed the rally.